The Bugzz Kids Duck umbrella is designed and built to last. Each canopy is made from high quality, high lustre PVC and is crystal clear allowing kids to not only stay dry but to see clearly where they are going. It has a generous canopy size of 82cm diameter and being dome shaped it allows great coverage from the head down. 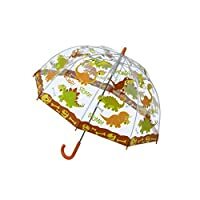 This umbrella is manual and has a special child safe slider with no sharp edges to damage little fingers. The spokes are FIBREGLASS meaning that they have both flexibility and super strength. 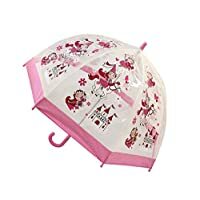 When you purchase Bugzz Umbrellas you are buying a great product from an established UK brand who are reliable and have over 20 years' experience in looking after you .. our customers. 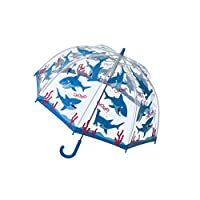 Bugzz kid's stuff children's pvc umbrella - shark. Closed length 70cm. Diameter when open 60cm. Manual opening. An exciting new addition from bugzz kids stuff. A range of seven easy open and close umbrellas. A simple mechanism makes it simple for small hands to work. 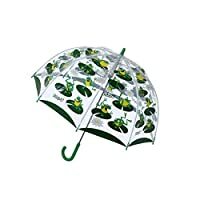 These umbrellas are in a clear pvc with the attractive bugzz designs.